can be used as modulator (AudioOut to another FmOperator’s FmAIns) or as carrier. Waveform is a sine wave. 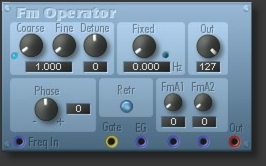 similar to FM Operator, but also capable of ring and amplitude modulation. 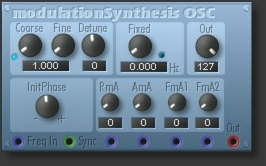 Instead of a gate input it has a Sync input, which can be connected to a Gate2Sync module, or a Sync oscillator SyncOut.